HELLO. 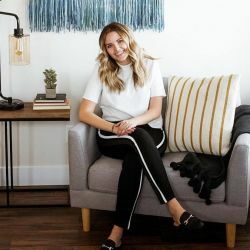 I'm Lauren Wallace, I am all about being creative and exploring style, especially in my home (well apartment). How modernyarn came about was when I finished decorating my apartment I noticed I needed a little something more in my bedroom to get the vibe I desired. I wanted something unique, modern, and boho to tie my room altogether. I could not find anything I loved until I stumbled on a picture on Pinterest of simple pieces of yarn tied on driftwood on Pinterest. It gave me the idea to make my own wall hangings with the colors and designs I wanted. I made one and loved it so much. It took my room to another level. It added so much texture and color I could not get over it. My art has evolved a ton since I began and I hope to continue growing and expanding my creating thinking to put out more unique forms of texturized art.